Last night was my turn to host my book club. The host usually has snacks and wine and since most of us are either arriving from work or from handing children off to a spouse who has just walked in the door, most of try to go hearty with snacks since it is essentially supper. Typically, I had so many things keeping me busy that I didn’t get any prep done ahead of time and walked in the door with a bag full of groceries and wine at about 5:30 to see a herd of dust bunnies galloping down the hall, piles of mail and clutter everywhere, a full dishwasher, and a lot of cooking ahead of me. Fortunately, the ladies of book club do not care a whit about my careless housekeeping, particularly if they are well fed, so I turned some MGMT on really loud, put my apron on, and cranked out my hummus recipe because it is so fast and easy and everyone loves it. With hummus in the bag, I got to work on a trio of crostini toppings – diced tomato and basil with olive oil, salt and pepper, chopped mushrooms sautéed in butter with rosemary and a little cream, and this Parmesan spread from 101 Cookbooks that I mixed with chopped artichoke hearts. Kate arrived first and helped me slice and toast my baguettes from the Antique Bakery (which still bakes all of its bread in an old coal oven) and open wine bottles. I have to admit I had worked up a little sweat getting everything done at the last minute, but our book club is always fun and worth the effort. Having recipes like hummus that are easy to throw together are great if you like to have people over but don’t have a lot of time to prepare. I served mine with a platter of crudite – red pepper slices, cucumber spears, slender blanched green beans, and celery to balance the richer crostini toppings, but I often bake whole wheat pita wedges to make quick pita chips. Note: because of the variety of textures in canned beans, I sometimes need more or less olive oil to get the texture I want. If, after blending, the texture seems stiff or dry, add a little more olive oil, or if it seems loose and soft, add a little less. Same thing with the salt- taste it before adding any because some canned beans are already salty. In the bowl of a food processor (I used my mini prep), combine the beans, garlic, tahini, lemon juice, and spices. Pulse the mixture until you like the texture- I prefer it pretty smooth but with a bit of chunky texture. Once you get the texture you want, taste it for salt and add the salt and olive oil. The olive oil and tahini make it creamy. Serve with a drizzle of olive oil on top. 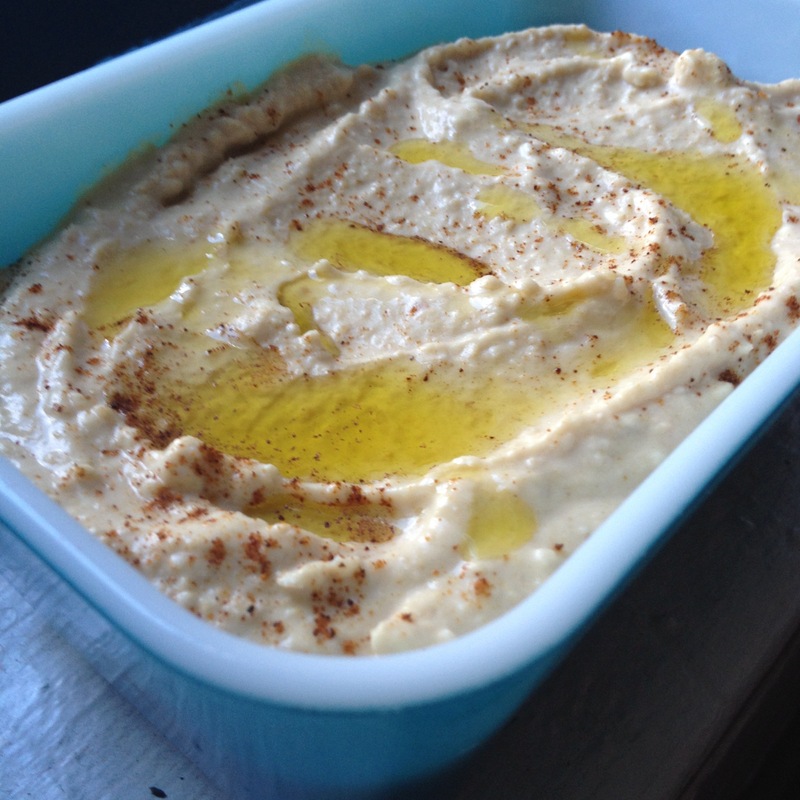 What is your edamame hummus recipe? Can you give me a little more detail about what you’re looking for? Didn’t you make it at the Stella and Dot party? Oh, ok- now I know what you are talking about. I made this hummus and a pumpkin hummus, not edamame. We’re you looking for the pumpkin recipe? Yes, YOUR hummus is yummus… I’m thinking particularly of your butternut squash hummus. I tried to make blackeyed pea hummus recently and learned that I really need to stick to a recipe. So, I’m happy to have this one! Yes, YOUR hummus is “yummus” (particularly your butternut squash hummus). I recently tried to make hummus with blackeyed peas that I had on hand, I learned that I really need to stick to a recipe. So, I’m happy to have this one.